Woodland PTW President Deena Thomas addresses the crowd after a monument in memory of former teacher Rhonda Martin was unveiled during a dedication at the school Monday (May 23). Rhonda Martin dedicated more than half of her life to teaching youngsters and becoming a role model to them for the 25 years she taught at Woodland School before succumbing to cancer at age 48 in January. Martin’s spirit lives through the countless number of people she impacted through the years, but Woodland assured her memory always will be part of the school community during a dedication May 23. A beautiful sculpture was dedicated to honor Martin’s 25 years of service (1985-2010). The sculpture, which will feature a bronze plate with Martin’s name and years of service, is erected in front of the school near the main entrance. 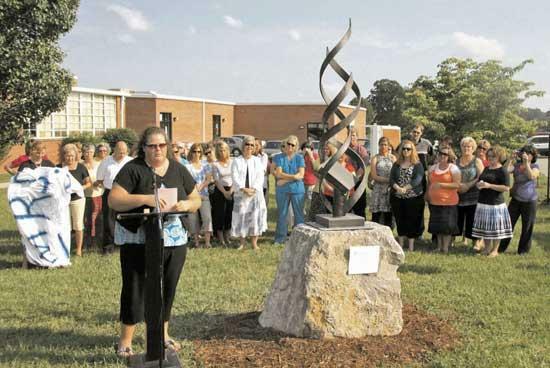 The sculpture was dedicated during a ceremony that included current and former Woodland students, current and former faculty members, several dignitaries from education circles, family and friends. Roger Martin, husband, and sons Douglas and Austin, were among those in attendance. Cannon County Director of Schools Barbara Parker spoke of Martin’s great reputation as an educator. “We loved her very much and she was very well respected in the educational field,” Parker said. Parker talked about Martin’s impeccable service and closed with the poem, “Why God Made Teachers,” by Kevin William Huff. Former student Jordan Bailey told the crowd how Martin had not only been a great teacher but motivated him to achieve more. Melodie Daniel taught with Martin at Woodland for 14 years and the two became the best of friends. Daniel spoke of Martin’s unwavering strength and love for family, friends and a desire to help others during an emotional and moving delivery. Daniel said Martin took a special interest in each individual child and that was one of the many great qualities that made her a highly-successful and respected educator. Daniel described her friend as “unselfish and strong,” and gave family members a solid piece of oak with Rhonda Martin’s name and years of service inscribed to signify those traits. I was wondering who was the artist?